One of the harbingers of spring that many people recognize is the sound of spring peepers calling from their wetlands for mates. Shortly thereafter, every still pool of water is laden with gelatinous egg masses, followed closely in time by an army of little tadpoles and gilled salamander larvae. While some of these will successfully complete their metamorphosis and turn into full-fledged frogs or salamanders, they face many perils along the way. The pools in which they reside are typically fleeting in nature, beneficial in that they do not support fish that would be predators, but detrimental if they dry up prior to metamorphosis. Other predators such as birds, turtles, and even other tadpoles remain a threat. Disease can also spread quickly through these sensitive communities, affecting many individuals rapidly. 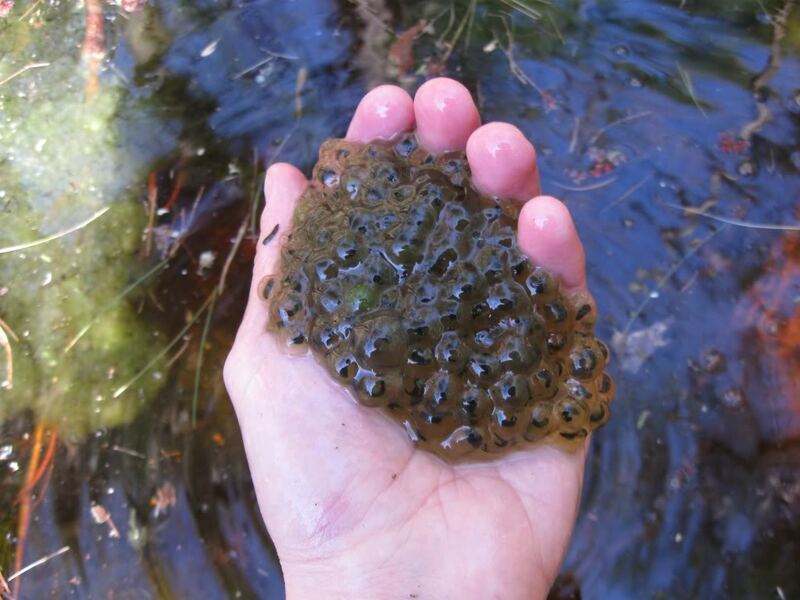 It was reported that a vernal pool in the Adirondack Park of New York was full of wood frog tadpoles that looked amiss- some ill and some recently deceased. This particular water source has experienced undiagnosed mortality in years past. 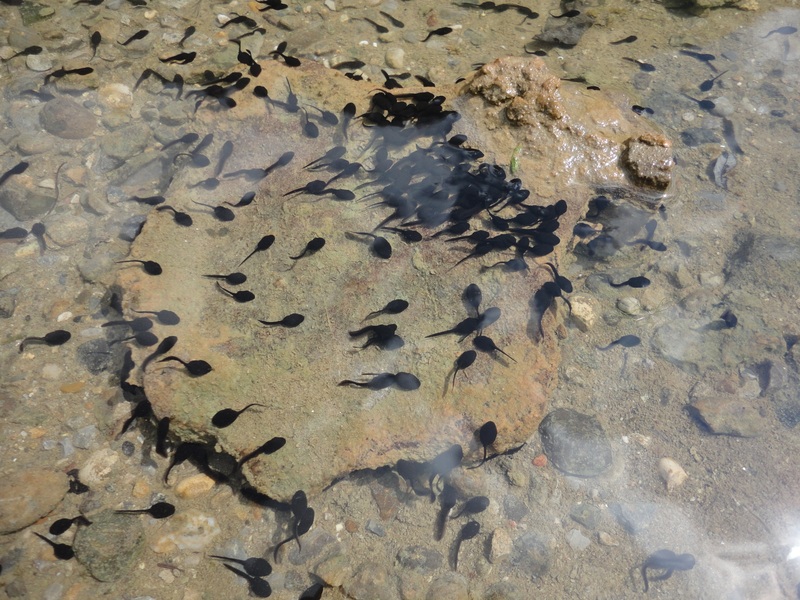 The researcher who noticed the problem collected six fresh tadpoles and submitted them to Cornell Wildlife Health Lab for testing. 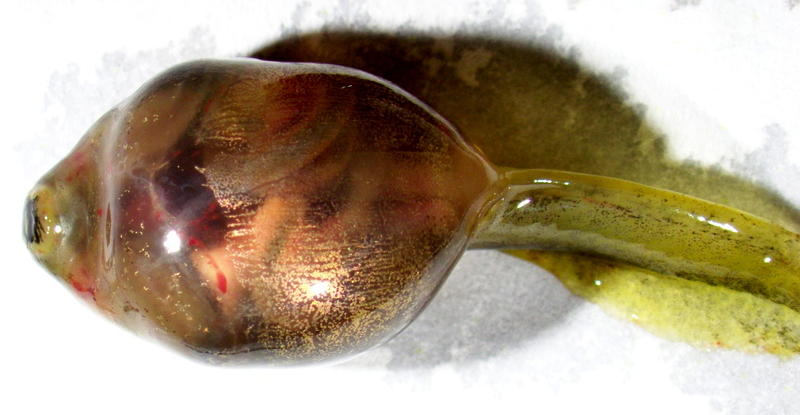 Each tadpole had a necropsy, which is an examination of the dead animal to determine the cause of death or disease, completed by a wildlife pathologist. Four out of the six animals were visibly unremarkable. 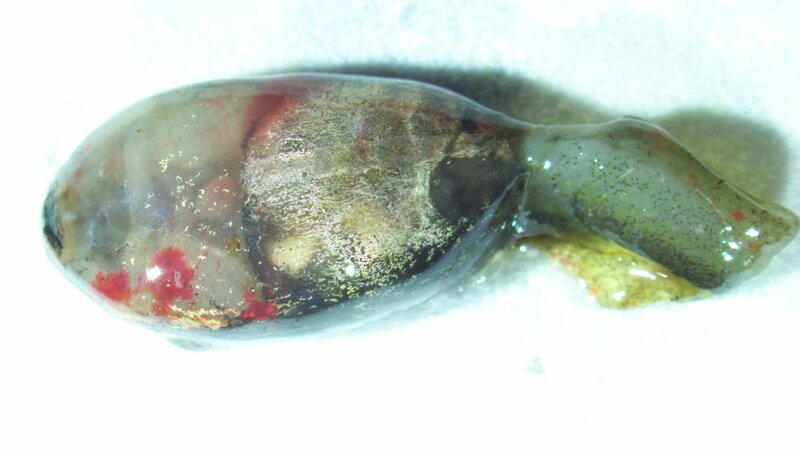 The remaining two tadpoles had bright red discolorations on the ventral surface of the body, the tail, and the mouthparts, and one had marked distension of the coelomic (body) cavity. Warning: Graphic Content. 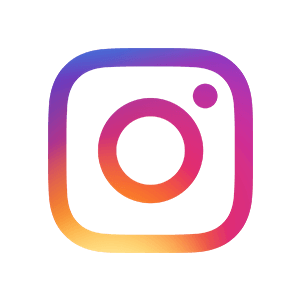 To view, click and hold on the image. 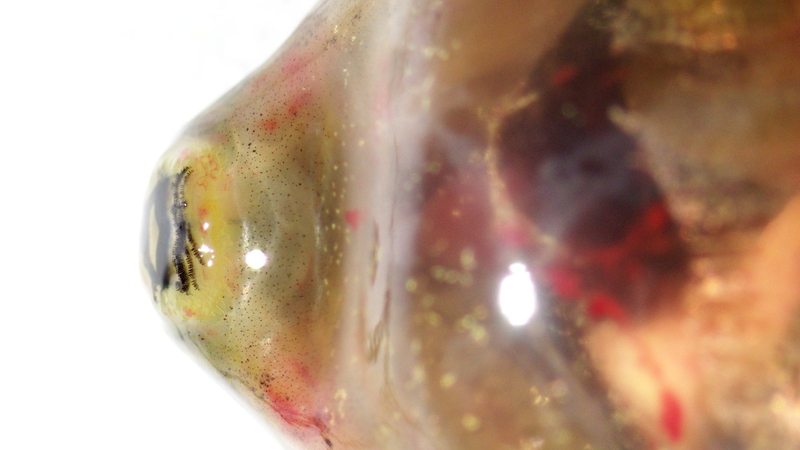 What diseases are often diagnosed in amphibians, and what clinical signs are present? It should be noted that these are not the only amphibian afflictions, though they are the ones commonly implicated in the infection of communities rather than individuals. Different species have different levels of susceptibility to disease. Additionally, presence of infection does not mean presence of a disease. We have numerous tools at our disposal that aid in diagnosing any of the above infections. Using histology may reveal fungal hyphae ("roots"), or cells changed by viruses. Histology is the microscopic study of cells and tissue structures and a key tool in veterinary medicine for diagnosing disease in animals. Special techniques can be applied to “highlight” affected areas, such as chemical stains that use acid/negative and basic/positive chemicals to pick up differently charged substances. PCR can be used to screen tissue samples for viral or fungal DNA. These tests were performed on the submitted tadpoles. We now know that life stage, species, and geographical location all play a role in making a final diagnosis. 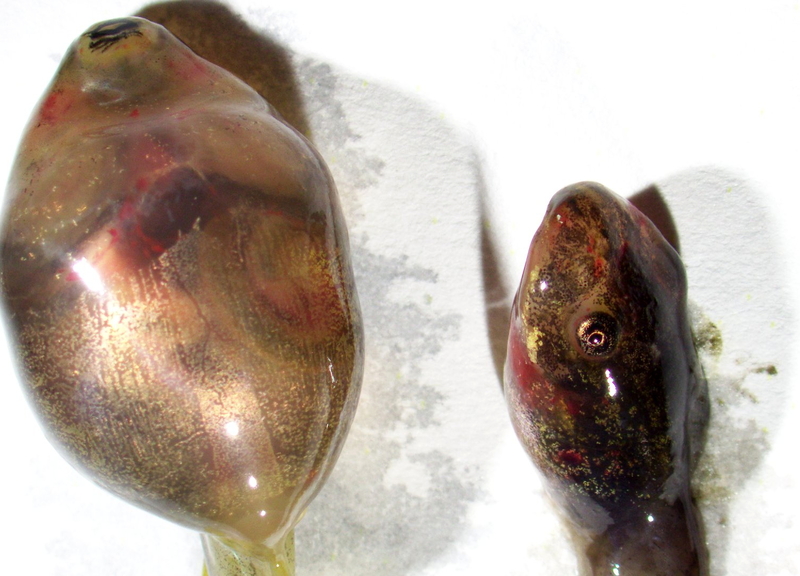 Using these clues in addition to necropsy and histology results, can you determine what was killing these tadpoles? Multiple mortalities of Wood Frog tadpoles from New York, along with lesions present on gross examination and viral inclusion bodies on histology, point to an outbreak of ranavirus. Immunohistochemical staining applied specifically for ranaviruses was positive, as was virus isolation. The species of ranavirus was identified by sequencing this isolate, and one tadpole was fixed in ethanol for future use in test development and validation. Certain species, such as native bullfrogs and non-native African Clawed Frogs, can be silent carriers of ranavirus. They can show no sign of disease, but can still pass it on to other animals. Ranavirus is difficult to eradicate due in part to the complex life cycle of amphibians, and the fact that it can be transmitted via contact with other individuals or through contaminated water. Amphibian diseases are easily spread from one wetland to the next, if care is not taken to disinfect properly between sites. They are also moved on bait animals, though the pet trade, and through live food markets. Some amphibians overwinter in their larval stages, including bullfrogs (which take two years to complete metamorphosis) and marbled salamanders (which, unlike other mole salamanders, are autumn breeders).